When E.’s plane from Amman touched down in Rome, she started to cry. After spending a semester studying abroad in Jordan, E., in town to visit friends, felt she could safely put on her Star of David necklace and her prized “If I Forget Thee O Jerusalem” necklace. Every year, according to NAFSA: Association of International Educators, more than 300,000 American students – 1.6% of the population enrolled in higher education – leave the US bound for universities in Europe, Australia and the Middle East. Four Jewish-American students – E., D., A., and Z., who preferred not to use their actual names – independently spent a semester studying in Jordan. They spoke with the Magazine about being surrounded by anti-Israel and anti-Jewish sentiments while remaining connected to Israel and Jewish practice. Officially, Jerusalem and Amman have had diplomatic, economic and cultural relations since 1994, when the late Israeli prime minister Yitzhak Rabin and the late Jordanian King Hussein signed a peace treaty, three months after declaring an end to the state of war between the neighboring countries. 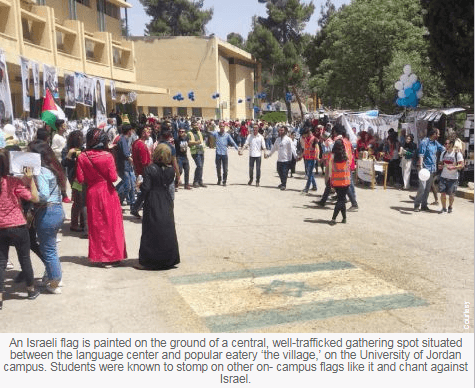 But the experience of E. and other American Jewish students studying Arabic language and Middle East studies in Jordan tells a very different story of relations between Jews and Jordanians on the ground. These students often hid their Jewish identities and pro-Israel feelings from host families, language partners and in one case, from a Jordanian Palestinian boyfriend. D., a student at a private Midwestern university, plans to make aliya upon graduation and work on Israeli-Palestinian dialogue. While in Jordan last year, he observed the public level of antisemitism to be high. His taxi driver announced “Jews in America – lots of money!” D. also learned of a widely-accepted belief that no Jews died in the September 11 attacks and that there is a conspiracy between Jews and ISIS. E. heard similar comments. One professor taught that Jews in America occupy a prominent place in politics because they have all the money and all the power. Another used a specific Arabic word meaning “to invade” only when referencing Israel, and claimed there was no Arab Spring in Saudi Arabia due to its close relationship with Israel. “I felt that everything I said had to fit in to the mainstream narrative, and that I wasn’t sharing a huge part of myself,” she says. For the four students, returning to Israel up to four times during the semester provided a welcome break from their time in Jordan. Crossing back into Jordan wasn’t always simple, though. D. had no problem carrying tefillin in his suitcase when he flew from New York to Amman to begin the semester. But when he tried to come back into the country after spending Rosh Hashana in Israel, he was detained at the border and questioned for two hours. He was told, “This is the law – you can’t go into Jordan!” Finally, a supervisor intervened and said in Arabic, “You will cover them up. Don’t take them out or use them in public!” D. did use his tefillin daily, but he made sure to pray in his room with the curtains closed. D, who describes himself as “a religious Jew,” bought a crock pot, ate pita and hummus in some restaurants, and ate Shabbat meals with friends. Yet he deleted his phone’s Hebrew keyboard and went to Israel for most major holidays. All students employed tricks while in Jordan to maintain their connection to Judaism and Israel. Student A. baked hamentashen for Purim and called them “American cookies.” E. had a secret “Jewish box” in her room for keeping matza during Passover, and she was careful to get her “Hebrew fix” of Israeli news sources while in the safety of her room. Z. made sure to consume (Jordanian) wine and pita each Friday night. The four students flew to Jordan to improve their language skills. Former meccas of Arabic study include Beirut, Cairo and Damascus – but these are no longer viable options. And Morocco, which currently offers an Arabic language immersion program, doesn’t offer exposure to the Jordanian Palestinian dialect which is of greatest interest to them, given their interests in future careers in diplomacy, military, academic and peace work between Israeli Jews and Palestinians. The program is aware that the issue of disclosing religious identity is complicated. “We offer students the chance to disclose information about their identity, but many opt not to,” said the representative, who preferred not to give her name. She mentioned that there is time built in during pre-trip orientation to discuss such issues. “Sharing connections to Israel, particularly citizenship, is not advised, given political tensions. We do our best to prepare students for the fact that they are highly likely to hear offensive and/or prejudiced language about Jewish people,” she said. D. will return to Jordan this summer for further study of Arabic.